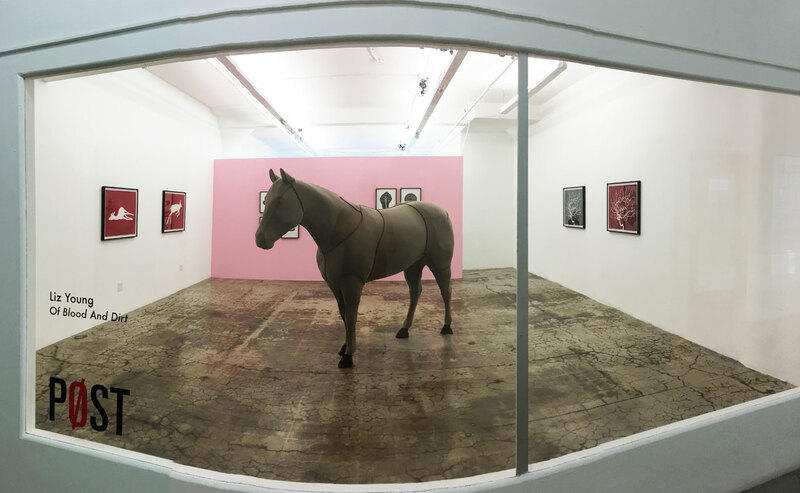 PØST is pleased to host a solo exhibit by Los Angeles artist Liz Young. 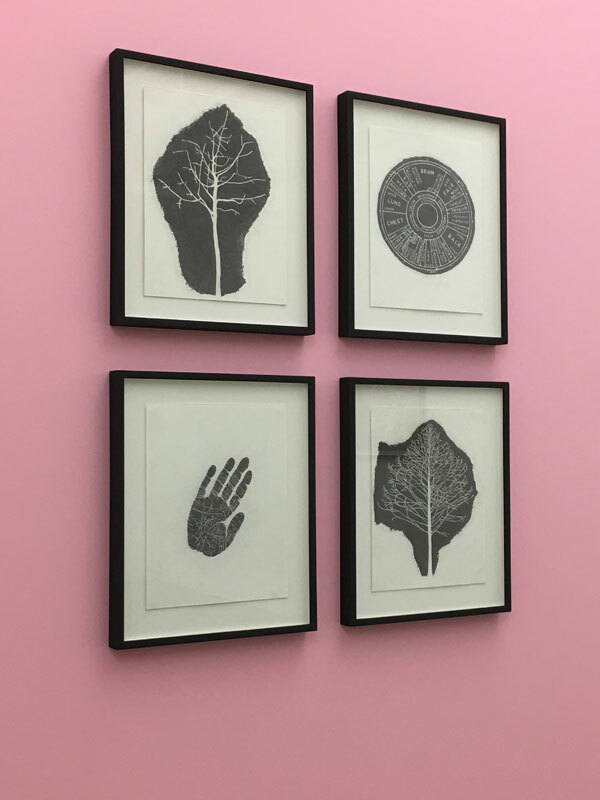 Dualistic in imagery, concept and process, her drawings and sculptural objects evoke feelings of loss and an acknowledgement of the inevitability of nature, its beauty and decay. Together, these individual works are presented as a contemporized version of the memento mori, or nature morte. 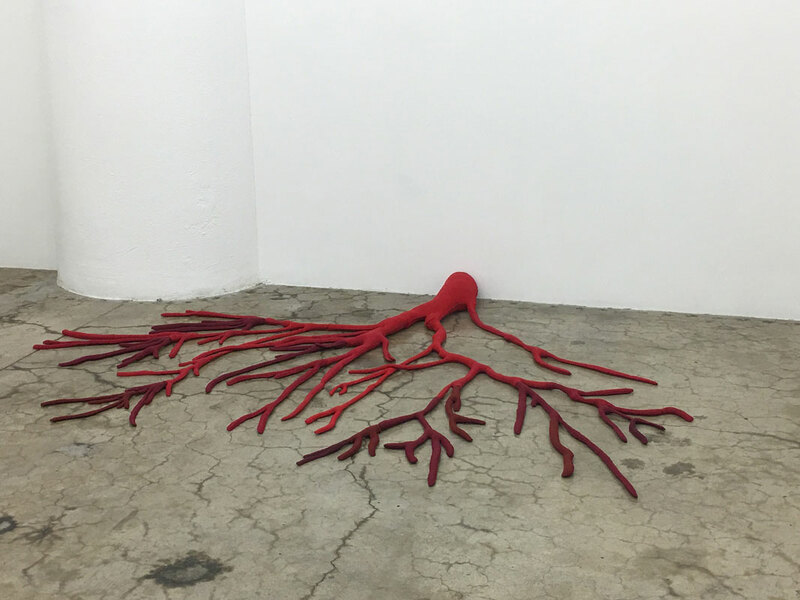 Young utilizes processes as varied as traditional art practices to handicraft techniques, always showing evidence of the human hand, with a sophisticated naïveté that reflects ongoing concerns about the human body and the natural world. She has stated, “My early work was loaded with dark imagery of pain and suffering, the spectacle was harrowing and tormented, searching for the significance of being and the origin of consciousness, expressing the anguish I felt. I used materials that were almost always detritus, creating labor-intensive work that implied dualistic connections like life and death, and confinement and independence. These themes still exist in my work today." Underlying narratives and her use of text underscore a special interest in literature that references nature and identity as characters. 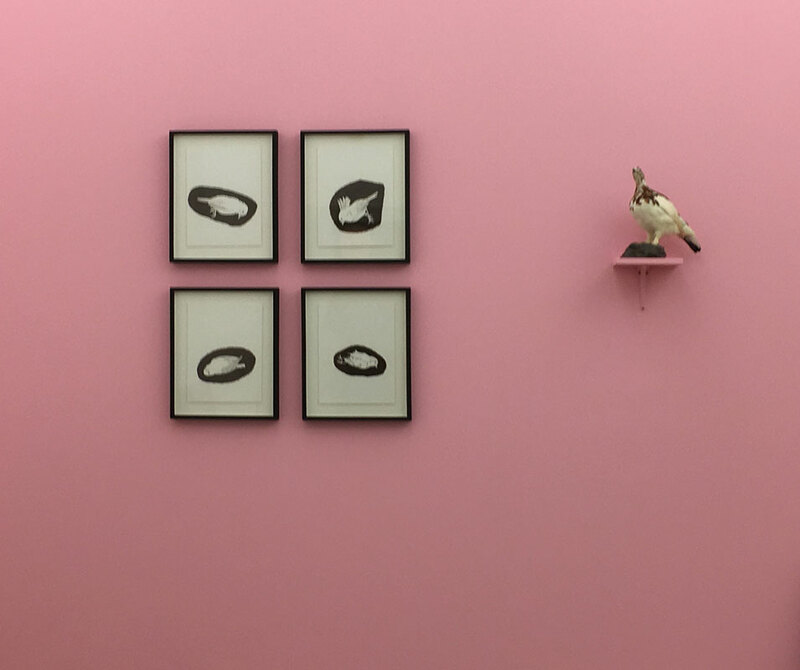 Recently, her use of text and images have focused on the absence of the image of nature and the body, with quoted texts from the writings of Truman Capote, Sam Sheppard and Annie Prioulx. 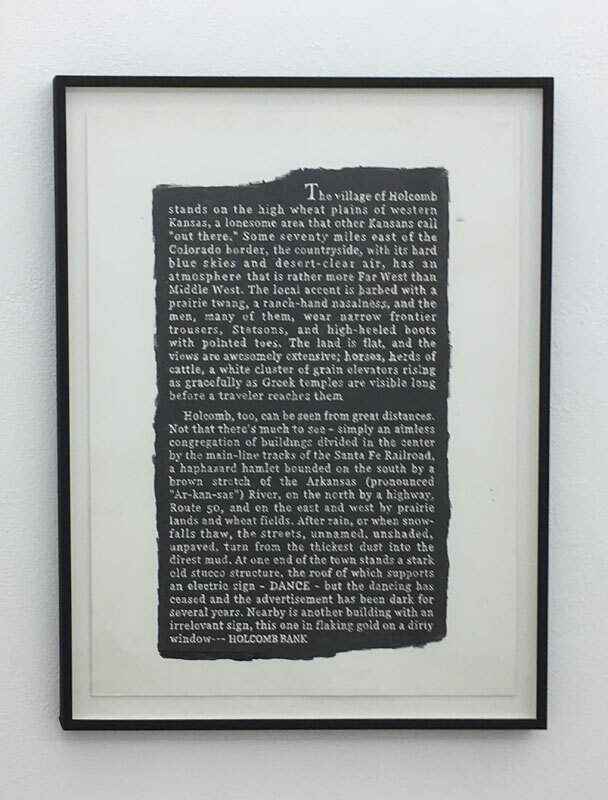 Images of a tree or a spine become the negative space surrounded by darkness, rendered in materials such as gunpowder, raw graphite and silver point, leaving the text knocked out and white. 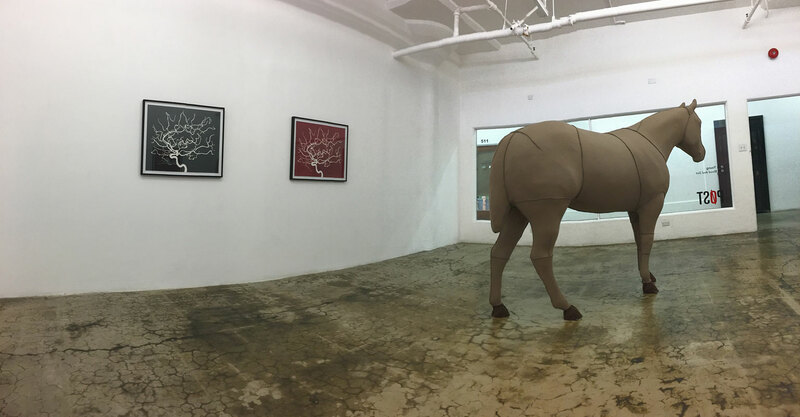 Young is drawn to imagery relating to hunting and Americana, like hunting targets, mounted taxidermy animals, the flag, hand embroidered samplers, wood burning brands, and found objects often recycled, distressed and second-hand that show evidence of its history. These material artifacts often make reference to the West and the American milieu that celebrates the allure and demonstrates the isolation; obtained trophies embodying a sense of achievement that comes with that sense of pride. It also reflects a curiosity with facsimile, replacement, and substitution of our natural environment. Liz Young, a 2016 Guggenheim Fellow, received a BFA from Otis College of Art and Design. She has exhibited her work in galleries and museums, nationally and in Europe, including Mölndal Konsthall, Mölndal, Sweden, Museum Kampa, Praque, and Exit Art and Hallwalls in New York. In Los Angeles, her work has been exhibited at Los Angeles Contemporary Exhibitions (LACE), Museum of Contemporary Art (MOCA), Santa Monica Museum of Art, Luckman Fine Arts Complex at Cal State LA, Long Beach Museum of Art, the Skirball Cultural Center, and Los Angeles Municipal Art Center (LAMAG). Besides the Guggenheim Fellowship, she has received a City of Los Angeles Cultural Affairs grant, California Arts Council grants, a Surdna Fellowship and J. Paul Getty Fellowship. She has also participated in residencies at the McColl Center for Visual Art in Charlotte, North Carolina; Ucross Foundation in Wyoming; Headlands Center for the Arts and the MacDowell Art Colony. Her works are in many private and public collections including LACMA, Lef Foundation, Greve Foundation, and the Norton Family Foundation. Young has taught at the California Institute for the Arts, The Los Angeles County High School for the Arts, Art Center College of Art and Design and Claremont Graduate School.